I’m pretty picky when it comes to slow cooker and freezer meals. Normally, it seems like they’re all centered around expensive meats that you still have to add side dishes to make a meal, so I picked two meatless casseroles and for the rest I used frozen chicken breasts (do not thaw!). Here’s a picture of everything before I got started. As you can probably tell I bought almost everything from Aldi and used some things (potatoes, peppers and corn) from my garden. *I just want to add that everyone has access to a different set of resources so do the best you can with what you have! Also, I was able to do this in 2 hours because I’m used to making most of these recipes, but if they’re new to you then it may take a bit longer the first time. The only pre-cooking required for the recipes that I chose was boiling the noodles. So I put the water on while I was gathering all of my ingredients and labeling my freezer bags. 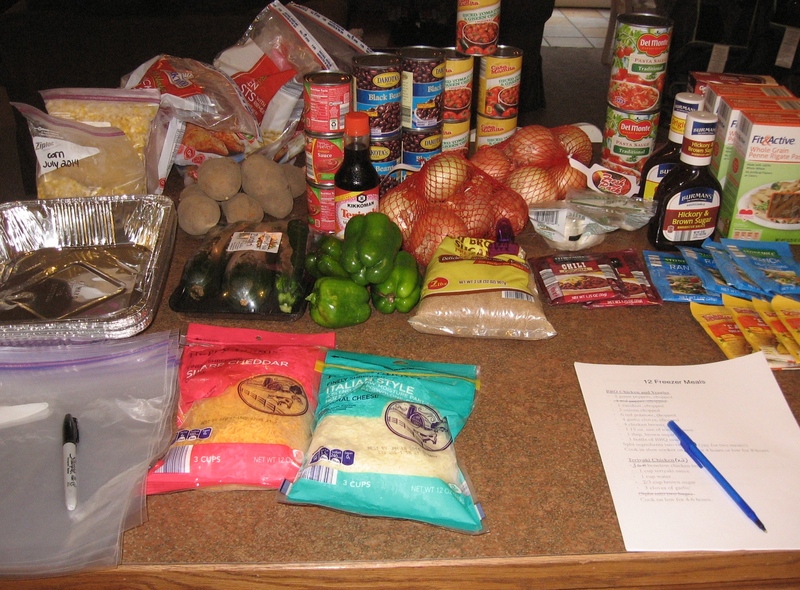 Once I got everything together, I chopped my onions and put the Chicken Taco Soup and Teriyaki Chicken bags together. *This recipe ended up being pretty runny because I reduced the amount of chicken from the original recipe. So I added cooked rice and veggies after it was done to make it a complete one bowl meal. These extra ingredients are not on the shopping list below. Cook in slow cooker on low 8 hours. Mix all ingredients in pot over medium heat until all ingredients are combined. Pour in casserole dish. Sprinkle cheese on top. Mix all ingredients in casserole dish. It was quite a bit of work, especially since I chose to do it alone with a toddler and baby in the house, but it was definitely worth it! I will probably do this again sometime soon. NOTE: For safety reasons all meat should be fully thawed before placing in the slow cooker. Thank you so much!!! I appreciate this being FREE and EASY!!! You don't even know how many sites I went to only to find out that I would need to pay for the content. I almost started to cry at how easy your site is and as a busy mama that is a huge blessing!! Thanks from the bottom of my heart!!! I'm so glad you are enjoying my site. I hope you like the recipes and don't forget to check out the Freezer Cooking section for more. So tasty and easy to follow! How would you cook the 3 slow cooker recipes otherwise? I've made the meals already but anticipate not being able to use my slow cooker to cook them and want to have another option if needed. Thanks!! The chicken and onions would need to be pre cooked for the Taco Soup and then you could just simmer it on the stove for 30-45 minutes. The other two could be cooked in a casserole dish at 350 until the chicken and veggies are cooked through. Anything WITHOUT tomatoes, onions or chicken?? Majority of freezer prep meals contain one or all these, so it's difficult to adjust in a rush. These are my allergies and I really want to up my meal plan/ freezer meal days in the near future. Thx!! Thank you so much for sharing these! I just went to our Aldi's and spent right around 60 for all the stuff. Although I may have made the creamy pasta bake wrong because it actually made three 9 by 13 pans full. It was enough to feed my family of 5 (3 adults and 2 little boys 5 and 6). We still had enough for leftovers for lunch the next day. When I make it again I'm thinking of adding cottage cheese or ricotta cheese to mke it more lasaganaish. I did drain my cans for the Taco soup so I'll purchase some bullion to add to the water. It was my mistake I was rushing and I'm greatly pregnant so I wasn't reading the instructions very well. Thank you again. Hi! I have been looking at freezer meals forever but have been too scared to try it until I found this post. I love how you created the shopping list (I am the WORST shopper!). Can't wait to try. One question... the recipes are all x2 or x4, does your shopping list account for this? Or should I multiply the the quantities of ingredients on the list also by 2 and 4? Thank you! Everything should already be multiplied for you on the shopping list. I'm so thankful I came across this post the other day! I've been wanting to freezer prep for months, but my son was born five weeks early so I never got around to it. Last night I prepped the chicken teriyaki and the creamy baked pasta... Can't wait to try more of your recipes! How many servings is each meal? I have a family of 6 to feed. All adults. I love this! I am putting this into action TODAY! I'll let you know how it goes! This is the absolutely first list of freezer meals that I think my picky kids would eat. My teen son is autistic and prefers simple yet whole food meals. Doesn’t like fast food, convenience food, white bread (will eat rice and pasta), etc. Finances are tight and I’m so not creative. Thanks for this list. I’m doing this the next time I buy groceries. I do not see any chicken broth. Are you referring to the boxes of noodles? You will prep everything and mix in the pan, but do not cook. Yes you just mix everything into bags and freeze. And yes you can freeze the pasta in foil casserole dishes. Thanks for.getting back to me! Also do you add any liquid when to the taco soup there's like basically no liquid in them? No broth? You can add tomato juice or broth if you prefer. Hello! This are the first freezer/crockpot meals that truly sound good to me and that i really want to try. no cans of processed soup loaded with sodium. Only one jar of pasta sauce which i assume is alfredo sauce and I bet that can be homemade. Thank you! will you tell me please how many people each recipe will feed? I only cook for myself and my sister. I wouldn't want more than four servings per meal. I hope to hear back from you soon! i am really looking forward to trying these recipes! These meals are for 4-6, so you would definitely have leftovers for two adults. Are the chicken breasts pre-cooked or raw? Can you use either? Raw is best since you will be cooking in the slow cooker once thawed. WHen chopping veggies for BBQ chicken-how finely chopped should they be? Just diced, they do not need to be finely diced unless that is your preference. I don't want to be naive, but, when you say (make this recipe x 2) for example, do you mean that you need twice the ingredients or that this recipe makes 2 batches? It means you will double the recipe. Hello, question - so we put everything in freezer bags after it's put together? Chicken goes in the bags frozen. Freeze till we need and then drop right in the crock pot for times noted? It's that easy? I feel like I might be missing something. Yes, although technically you're supposed to thaw it before cooking in the slow cooker for food safety reasons. I like all of the ingredients in the recipe and they all look good. When i cook for us two i generally make a full batch Recipe and follow up with freezing whats left after plating. Recently i made chili for four now I have a meal in the freezer with some black beans which I cooked to put in it rather than a can of beans. I've got three cans of black beans worth in the freezer for other things should I need a can. When making banana bread I double the batch freezing the other three loafs for later. Since moving I have only a nine by nine backing pan so our carrot pineapple coconut cake had to be baked in that and a loaf pan which I froze ; I cut off a piece when I make my finace's lunch. Thanks for the inspiration to batch cook by the week. Hello, these recipes look wonderful and easy to make. 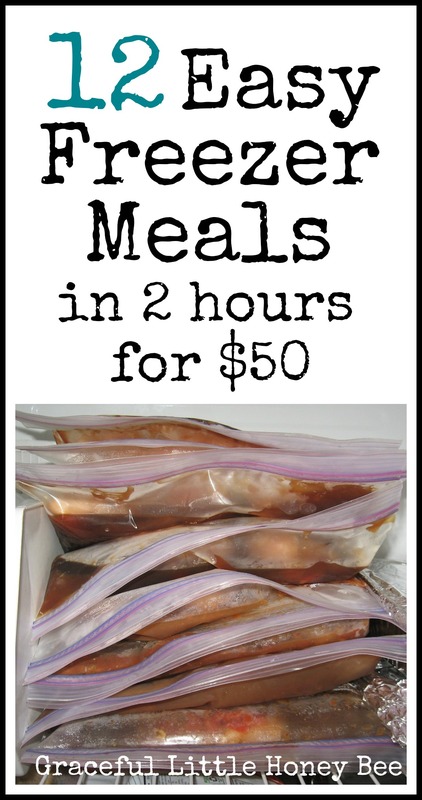 How long will these meals last in the freezer? 3 months in a regular freezer and up to 6 months in a deep freezer. You don’t have to add any water or broth to the taco soup one? You can if you feel that it needs it. Did you use square pans or 9 x 13 pans? 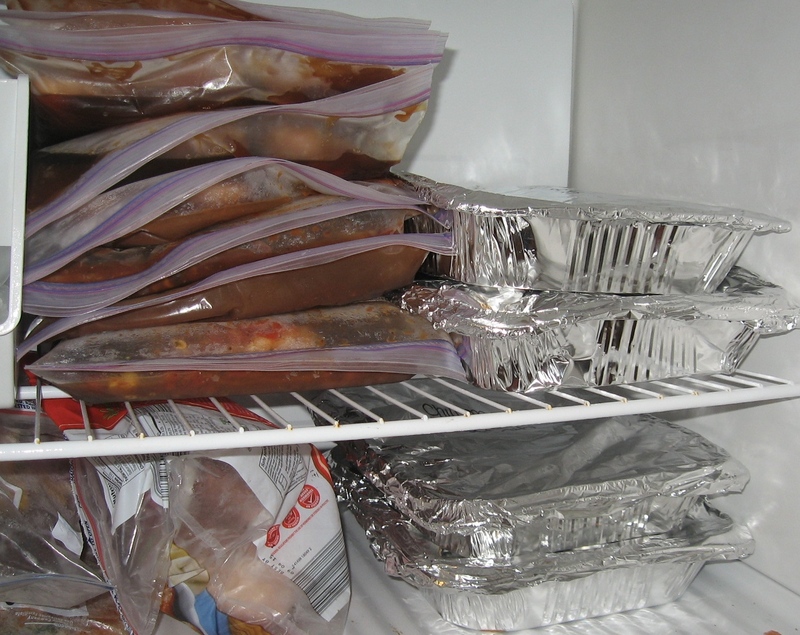 One more question and probably a dumb one but do you defrost the meals before cooking? nevermind! I saw where you answered this question in September. Got it! !